This incredible, historical film opened my eyes and made me better understand the world I live in. Given that racism is still a prevalent issue in today’s society, it was mind-boggling to see it in Britain, at the turn of the 20th century. I admire how this film brings the past to the present, and made me question how racism can dissipate in the future. This film carefully documents the relationship between Queen Victoria and her beloved servant, Abdul Karim. Queen Victoria reigned in the United Kingdom from 1837 to 1901. She was the longest serving monarch in world history. In addition to being a queen, she was also the Empress of India. Because of this, Abdul Karim and his friend Mohammed are sent from India to Britain to deliver a sacred coin: the Mohur. Abdul and Mohammed believe they are only going to remain in Britain for a short period of time, but they end up going on the adventure of a lifetime. Judi Dench, who plays Queen Victoria, exceptionally portrays a queen who is tired of her constriction. All she wants to do is have Abdul be her full-time servant, but because of his origins, Queen Victoria’s staff does not approve. Ali Fazal, who plays Abdul Karim, considers the queen a very special person and his kindness towards her is impeccable. He teaches her the Quran and shares his culture with her. As time goes on, both develop a strong friendship, which is truly heartwarming. The setting is remarkable. I’ve never seen the Taj Mahal, Scotland or the queen’s palace. This film takes the audience to all these places. After seeing the beauty in other countries, it makes me want to travel the world. My favorite part of this film is when Queen Victoria eats with her staff. She eats very quickly and, once she finishes her food, regardless if the others are done or not, the servants take all of the food away. It’s hilarious to see people still eating their meals and have their food taken away in the blink of an eye. The message of this film is that no race, culture or religion is subordinate to another, even though individuals are from many different backgrounds. Britain is usually portrayed as one of the most powerful countries, but not in this film. We have to learn to not categorize others as inferior because of their lifestyle. Differences make society beautiful. If we were all the same, everything would be boring. I give this film 5 out of 5 stars and recommend it to kids ages 15 to 18 as well as adults. There are undertones of adult subject matter throughout the film. Queen Victoria is infatuated with much a younger, married man, which is why an older audience is more suitable for it. Check it out when it opens in select theaters on September 22, 2017. I guarantee you’ve never seen anything like this before. How could the Empress of the British Empire and a poor Indian clerk possibly have anything at all in common? The fact that there is much that they share is a major theme in Victoria and Abdul. One example is that they are both in “prison.” You first see scenes with Abdul and Queen Victoria in their native habitats: waking up, doing their jobs and, we see that they both exist in confined situations. Abdul works in an actual Indian prison, doing a very boring job and Victoria later says she is “in prison” because she cannot do what she wants to do, which is to explore the world. In one surprising scene, Victoria actually falls asleep at the table at her Golden Jubilee dinner! Abdul catches her eye and he becomes a window to the wonderfully exotic world of Indian culture. Every British character in this story, except Victoria, is a terrible racist. The Royal staff of Queen Victoria disapproves of her friendship with Abdul and are constantly conspiring to sabotage their relationship. In contrast, Queen Victoria is fascinated by India, the languages, architecture and just about everything. She wants to explore India, but she cannot because if she does, she likely will be assassinated by the oppressed Indian people. Her son and heir Bertie (later King Edward VII) is the most hateful of all. One of the first things he does as king is to burn all evidence of his mother’s 14-year friendship with Abdul that exists among his mother’s papers and photographs. 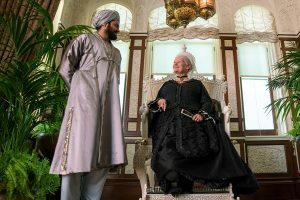 I give Victoria and Abdul 5 out of 5 stars because it tells the remarkable story about how two people from very different worlds come together as friends. I recommend this movie ages 13 to 18 because there are no intense moments and the plot is slightly complex. There are only funny, sweet, beautiful and some sad moments. 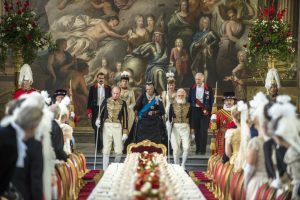 You can see Victoria and Abdul in theaters when it opens on September 22, 2017. 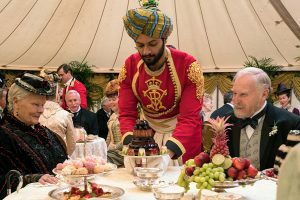 Victoria and Abdul is a surprisingly humorous historical drama with great performances from its two main leads. 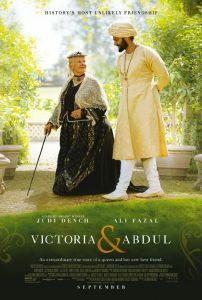 Victoria and Abdul opens in India when Abdul (Ali Fazal) is chosen to take a long voyage to England to present a special coin to Queen Victoria (Judi Dench). During the ceremony, something sparks their long, close and unusual friendship which is the subject of the film. Victoria and Abdul follows the queen in the final years of her rule. She is 81 years old and finds little happiness in her day-to-day life until Abdul arrives. Abdul teaches her how to speak and write in Urdu and soon becomes her “munshi,” a spiritual adviser. Many in the queen’s household do not approve of their friendship because of Abdul’s origins. Nevertheless, their friendship thrives. 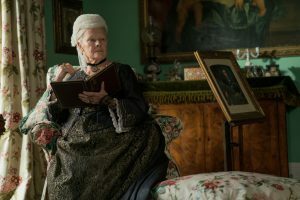 Judi Dench plays a quite believable Queen Victoria and brings out both the stubborn and kind sides of her character. Dench really shows a range of emotions and truly brings out the personality of this historical figure. Dench makes Victoria’s loneliness so convincing that I felt her pain. Her rudeness makes sense considering every day she is followed by a selfish posse of unfaithful followers. When Abdul arrives, the kinder parts of her character come alive. Ali Fazal portrayst a very likable Abdul, but he feels poorly developed in comparison and never really gets a chance to shine. I also have to give props to Eddie Izzard who plays Queen Victoria’s son Bertie. He is a believable villain and keeps up a terrible personality until the final frame. Despite the talented cast, this film feels disjointed. There’s too much going on and too many characters to keep up with. Victoria and Abdul never quite fully develops the relationship between the title characters and the film suffers because of it. It also tends to be melodramatic at times, especially at the end. I recommend it for ages 13 to 18. This films talks about some subjects that could be unsettling to explain to a younger child. Little kids will probably not enjoy the film as much as tweens, teens and adults because they won’t know the history and the context. I give the film 3.5 out of 5 stars. At its core, this film is about how one friendship overcomes prejudice and racism. Victoria doesn’t care what other people think about Abdul. He is her friend and that’s all that matters. The battle for NINJAGO City calls to action young Master Builder Lloyd, aka the Green Ninja, along with his friends, also secret ninja warriors. Led by Master Wu, as wise-cracking as he is wise, they must defeat the evil warlord Garmadon, who also happens to be Lloyd’s dad. Pitting father against son, the epic showdown tests these fierce but undisciplined modern-day ninjas as they learn to check their egos and pull together to unleash the inner power of Spinjitzu. KIDS FIRST! Film Critic Benjamin P. comments, “The LEGO Ninjago Movie is a clever animated film that stumbles in its first act but quickly reclaims its footing for a highly enjoyable finish.” Ryan R., adds, “This film is really fun, because it has humor for all ages and the special effects look very interesting and cool.” Calista B. chimes in with, “Of course, I have to start this review by mentioning the visuals. This movie is stop motion animation, made using LEGOs. And, aside from a few live action parts, EVERYTHING is made out of LEGOs. And it looks amazing.” Morgan B. sums it up with, “What do you get when you mix a crazy cat, stealth ninjas and an evil villain? The LEGO Ninjago Movie which is an action packed adventure.” See their full reviews below. Surprisingly, I found this movie really enjoyable. I say surprisingly because, I am not a fan of Ninjago. Yet I managed to find it as funny and charming as the previous LEGO Movies. The movie follows the story of the Green Ninja Lloyd, as he struggles to cope with his father, Garmadon, being an evil villain. This affects how the citizens of Ninjago see him and how they treat him. After Garmadon takes over Ninjago, the ninjas go on a journey to find the ultimate weapon to save Ninjago. Of course, I have to start this review by mentioning the visuals. This movie is stop motion animation, made using LEGOs. And, aside from a few live action parts, EVERYTHING is made out of LEGOs. And it looks amazing. Like The LEGO Movie and The LEGO Batman Movie, this movie looks so good. The city of Ninjago, the subtle Japanese atmosphere, the expressions, they all look great. Since this movie has a lot of action as well, it took over four years to make. It is so impressive and I can’t imagine what patience it took to create. Similar to the other LEGO Movies, this film manages to be both hilarious, yet deep and meaningful. The story is all about a kid’s life being influenced by his dad’s bad choices, which is a heavy subject. It is handled very seriously and maturely. Kudos to the writers, Dan and Kevin Hageman as they’ve made an amazing product. The movie has moments where Garmadon and Lloyd talk about their relationship and their broken family. That is really well done. The voice actors are also really great. Kumail Nanjiani as Jay is a particular stand out to me. For some reason, I found his voice very adorable and energetic. Honestly, all the voice actors show a lot of energy and effort. Now, as I previously mentioned, I don’t know much about Ninjago. I was nervous I wouldn’t understand this movie because I don’t follow the series. But thankfully I can say that is not the case. I know almost nothing, yet I got the general idea of the story. So, if you’re worried about not understanding the story, you’re in luck. This movie can stand alone. I give this movie 4 out of 5 stars. As for who I think would enjoy this movie, I recommend it for ages 5 to 18, and remind you that you don’t need to like Ninjago to enjoy it. This movie comes out in theaters on September 22, 2017 so, look for it. The LEGO Ninjago Movie is a very cool and funny movie that is perfect for the whole family. In this film, you meet Lloyd (Dave Franco), the green ninja, but outside of his ninja life, his dad is Garmadon (Justin Theroux), an evil ninja trying to rule Ninjago, Lloyd’s homeland. When Lloyd is at school he has to deal with bullying and is treated like an outcast because of his father. After a particular incident (can’t elaborate because it is a spoiler), Garmadon and Lloyd are forced to work together and go on an adventure. Joining them on this adventure to find their inner power are Lloyd’s friends, Kai (Michael Pena), Cole (Fred Armisen), Nya (Abbi Jacobson), and Jay (Kumail Nanjiani). The question is: will they find their inner power? This film is really fun, because it has humor for all ages and the special effects look very interesting and cool. My favorite scene is when a real-life cat comes to Ninjago and starts terrorizing all the LEGOs. The cat looks like it really is destroying all the ninjas and civilians. I additionally like the water effects they use, instead of the using the traditional LEGOs, like they did in The LEGO Movie. I love the comedy because it has adult humor without making it obvious to kids and it’s not inappropriate. My favorite character is Garmadon because he always says Lloyd’s name wrong throughout the film. He also exaggerates when he tells his flashback story and it made me laugh a lot. It will definitely make you laugh as well. I must say this film doesn’t drag and there are a couple of New York anchors that make surprise cameos in this film. However, there is one thing I would like to point out. There are a few intense scenes, so this a know-your-kid kind of movie. This film also contains mild violence and rude humor. I give this film 5 out of 5 stars and recommend it to kids ages 5 to 18. I think adults may like this as well. People who like action, adventure, family, children, LEGO and comedy films will also enjoy it. This film comes out September 22, 2017 in theaters nationwide, so go check it out. The LEGO genre is rising and you should go see it, because they are stepping up their game. This is a must-see film. What do you get when you mix a crazy cat, stealth ninjas and an evil villain? The LEGO Ninjago Movie which is an action packed adventure. I want to watch The LEGO Ninjago Movie again and again because the animation is fantastic and uses real life LEGOs. This story, told through the eyes of a young boy, captures your heart with friendship, parent controversies and team work. The voiceovers are magnificent. It’s as if you can feel the characters’ emotions from the tone of their voices. This film has terrific characters such as Master Wu (Jackie Chan). I love Master Wu and the way that Jackie Chan portrays this character as someone who knows some amazing karate moves to help their students. My favorite character is Master Wu because he is hilarious and tells some good jokes, even when he doesn’t know that he is making them. Guess what? A crazy fact about Jackie Chan (who has been acting since he was 7-years-old) is that he performs his own stunts and has broken every bone in his body. He is remarkable. I talked with him in person at LEGOLAND California just a few days ago. During our conversation, I discovered that his goal is to introduce children to martial arts and teach them how to find inner peace. Jackie Chan also plays Mr. Liu in The LEGO Ninjago Movie. Cole (Fred Armisen) is a very kind and musical ninja at heart. When I met Fred Armisen, I discovered that he is very musical and knows how to sing Jingle Bells very well. I love the way that he connects with Cole through music and I love that they both love being ninjas, even when not on camera. Cole is a ninja who is very calm and quiet, yet when it is time to lay a bet no one is better for the task than him. Lloyd (Dave Franco) is an amazing ninja who tries his best to do what is right and find a way to eradicate the evil Garmadon (Justin Theroux). Lloyd is the kid in school who no one likes because his dad is the evil villain Garmadon. During the daytime, Lloyd deals with bullies. Then at night and when he is needed most, he turns into a ninja with his friends Cole, Jay, Kai, Nya and Zane. Jay (Kumail Nanjiani) is the anxious, yet adorable kid who I love and, who in real life he thinks that the cat was a pain to shoot with. When they were shooting they used two identical, twin cats and it was very hard to shoot them for technical reasons. Kai (Michael Peña) loved the shoot and thought it was a dream come true because, when he was hired he automatically became a ninja inside and out and he loves that feeling. Zane (Zach Woods) says that he was practically born with a robot voice and that he didn’t have to practice at all for this role. Nya (Abbi Jacobson) told me that we all are ninjas and that we don’t have to worry about not being cool or amazing, as we are all those things at heart. The best scene in this film is when Garmadon and Master Wu have a gigantic martial arts battle and fight each other for good vs evil. I love this scene because it is spot on with the timing and the ending was quite shocking. I recommend this film for ages 6 to 18 as well as adults. People will love it because of the adventure. I give this film 5 out of 5 stars. You can see The LEGO Ninjago Movie on September 22 when it opens in theaters nationwide. The LEGO Ninjago Movie is a clever animated film that stumbles in its first act but quickly reclaims its footing for a highly enjoyable finish. T he storyline follows Lloyd, who on the surface is a typical 16-year-old. It’s Lloyd’s parentage that makes him different. He is the son of a ruthless warlord named Lord Garmadon. You’d think that Lloyd is the man himself considering how his fellow high school students constantly pick on him. Garmadon left when Lloyd was an infant and Lloyd has hated his father ever since. Advised by the noble Master Wu, Lloyd and five of his friends disguise themselves as ninjas in elaborate giant robots to fight against Garmadon’s attacks on their city. Wu sends Lloyd and his friends on a perilous journey to find weapons that can help them defeat a creature that poses an even bigger threat to the fate of Ninjago City than Garmadon and his goons. My favorite character in this film is Lloyd (Dave Franco). This character has an emotionally rich back story that changes how you see him and made me sympathetic towards his character. Lloyd is surprisingly complex and the film shows how difficult it is for Lloyd to not give in to the negativity going on around him. Despite his evil roots, he comes out good-natured and more aware of the world around him than ever. Justin Theroux is great as Lord Garmadon. He gives the character a big personality. It’s a nice change of pace from his more dramatic work and you can tell he is having a lot of fun voicing this character. The father and son dynamic between Lloyd and Lord Garmadon is an excellent element of the story. The scenes they share are so funny and they do play off one another really well. T he action scenes in this film are very well executed. The fights feel well choreographed and they never lose my interest. The giant robots are cool to look at and fit each of the characters’ personalities and true powers, making them more than just machines. I recommend this film to ages 4 to 12. Lord Garmadon could be a little frightening to younger children. I also think many adults will enjoy this film because there are some one-liners that are custom built for their amusement. I give it 4 out of 5 stars. You can see it in theaters when it opens September 22, 2017 so, keep your eyes out for it in a theater near you. Adventure takes flight with the plucky P. King Duckling! 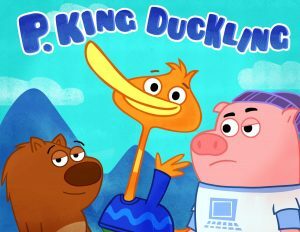 Meet P. King, a slightly hapless but intrepid young duck, and his two best friends, Chumpkins (a sarcastic pig) and Wombat (who helps P. King with his schemes even though she knows better)! Together, they work to seize the day: which always leads to wild adventures and hilarious consequences. Created by award-winning Josh Selig (Sesame Street, Wonder Pets!) and featuring music from Grammy winner Marty Beller of They Might Be Giants, P. King Duckling is a wholly satisfying family experience that engages children in problem-solving and creative thinking: all while quacking you up! KIDS FIRST! Film Critic Morgan B. comments, “The lessons that P. King Duckling, Wombat and Chumpkins teach are also quite useful. The animation in this show is simple with lots of colors and shapes. It is perfect for kids.” KIDS FIRST! Adult Juror Rachael V. adds, “This is a cute show about a group of friends who take funny adventures and find solutions to problems along the way.” See their full reviews below. The fun adventures shared here are creative and quite enjoyable. The lessons that P. King Duckling, Wombat and Chumpkins teach are also quite useful. The animation in this show is simple with lots of colors and shapes. It is perfect for kids. It is easy to follow and understand so you can do some of the experiments that they do in your imagination. My favorite episode is “Wombats Big Surprise!” This episode is so funny and enjoyable because of the humor and how Wombat doesn’t know about her big surprise birthday party. I also love that Chumpkins and P. King Duckling hide things. It also teaches you about patience, which is a difficult lesson. My favorite character is Wombat (Courtney Shaw). She is smart, creative and likes to help her friends. Wombat knows how to make lots of fun things such as painting pictures. Courtney Shaw voices Wombat and makes her sound very inquisitive and caring. She fills Wombat’s voice with lots of emotion in all the episodes, which is something I admire. P. King Duckling (Marc Thompson) is very goodhearted and a silly duck who loves adventure. He finds new fun ways of doing things such as cooling the town he lives in during a heat wave, jogging the Great Wall of China and many more that have great moral values. 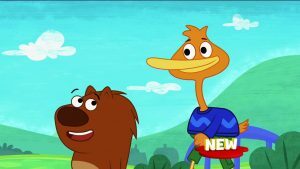 Marc Thompson’s P. King Duckling has an adorable voice that sounds like a nerd which brings P. King Duckling to life and makes him enjoyable. Chumpkins (Benjie Randall) is a computer geek and loves technology. Chumpkins is proud of this and wears a shirt with a computer on it. Whenever you need something delivered house right away, have Chumpkins order it online. He also knows a lot about gadgets and gizmos so he is the Pig to call. Benjie Randall makes Chumpkins sound older then he is and that is reflected in his personality and makes you believe he is very smart. Some of the life lessons in this story are about being a good friend, what friendship really is, how to exercise creativity, using your imagination and learn how to work as a team. The lessons are very valuable, because even I forget how to be a good friend sometimes. It is a great reminder about how to be a good friend for older kids while teaching younger kids the basics of friendship. It reminds you to use your brains and work with others when trying to solve problems. I recommend this DVD for ages 4 to 8. Even tweens and teens will benefit from it the life lessons are priceless and everyone will enjoy the characters with their quacky, quirk personalities. I give this DVD 5 out of 5 Quacking Ducks. This is available now on DVD so, check it out. You’ll be glad you did. This is a cute show about a group of friends who take funny adventures and find solutions to problems along the way. 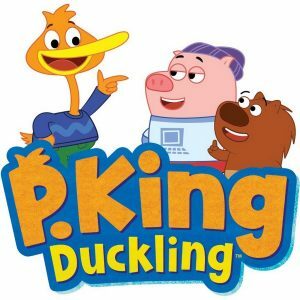 P. King is a funny duckling who constantly gets the group into trouble with his big adventures. Luckily, he has two friends that help keep him centered and out of trouble. There’s Wombat who always supports P. King’s decisions and Chumpkins, an attitude-riddled pig who is the muscle of the group. He is my personal favorite because he is funny and sarcastic all the time. 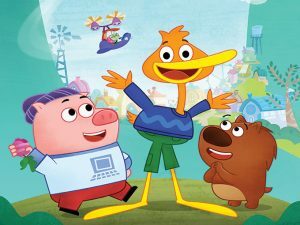 This trio deals with the bad guy, Greg the Goose and teaches us that there are many creative solutions to even the smallest of problems. My 19-month-old absolutely loves this program. The art style reminds me of Phineas and Ferb. I recommend this DVD for ages 3 to 7 and give it 5 out of 5 stars. My only complaint is its lack of story depth. Everything is over simplified, which is expected for the target age group, but I wanted more. Life on B612 has resumed to normalcy. Rose, Fox, and the Little Prince are living peacefully, maybe too peacefully. Then one night, Rose hears the Snake telling her that she has a home planet with a family. Rose asks Little Prince to find her planet because she’s afraid it’s in grave danger. 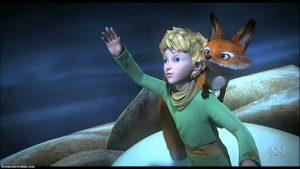 The Little Prince asks Fox to keep an eye on Rose as he flies off on his plane to try to find more information on her planet. 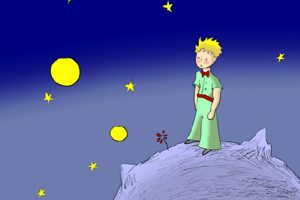 While searching for Rose’s planet, the Little Prince encounters four characters who tell him that Rose’s planet is in another galaxy far beyond interstellar space. Back on B612, Rose is bothered with nightmares and is becoming irritated. After an argument with Fox, they free the Snake. When the Little Prince finally returns to B612 and learns that the Snake has been freed, he collapses. His friend, the aviator, comforts him and urges him to set off on a new adventure to fight his worst enemy again. But what about Rose’s planet? The aviator mysteriously explains – those you save will guide you. KIDS FIRST! Film Critic Samantha M. comments, “This imaginative animated film warmed my heart. Elaborating upon a conquest to find Rose’s family, the friendship that Little Prince, Fox and Rose share is remarkable. Each character differs from one another, but they all manage to combat the forces of evil together, which in turn, strengthens their relationship in a way never seen before.” Alejandra G. adds, “I love that the Little Prince doesn’t just throw the life lessons in your face. It’s not obvious because, when you start watching it, it’s simply a casual storyline. But, if you pay close attention and analyze the characters and the events of the story, you start to notice all of the metaphors, figures of speech and symbols that hide real life lessons and sincere messages.” See their full reviews below. 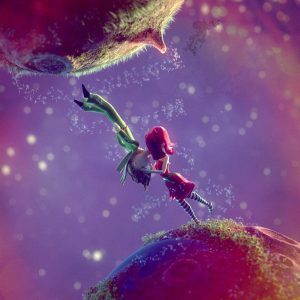 This imaginative animated film warmed my heart. Elaborating upon a conquest to find Rose’s family, the friendship that Little Prince, Fox and Rose share is remarkable. Each character differs from one another, but they all manage to combat the forces of evil together, which in turn, strengthens their relationship in a way never seen before. With such a divine plot, exquisite action scenes and heartwarming friendships, there is something for everyone to enjoy. Previously, the Little Prince defeated an evil snake and trapped him in his beloved sketchbook. Everything on B612 is peaceful again. Rose, Fox and the Little Prince are enjoying life, playing games with one another and building stable friendships. But one night, the Snake tells Rose that she has a family that is in danger. 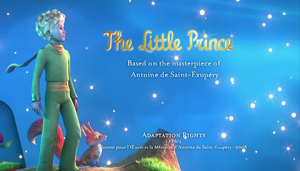 It is up to the Little Prince, Fox and Rose to work as a team, and try to reunite Rose with her family. Marion Cotillard, who plays Rose, delivers exceptional dialogue with her sweet voice. Her laugh is infectious and seeing Rose smile through every difficult situation is very inspiring. Cotillard portrays Rose as optimistic, through her desire to never give up and this is something that everyone can learn from. Riley Osborne, who plays the Little Prince, is very charming, because he cares about Rose and will do anything to help her find her family. He asks Fox (James Franco) to keep an eye on her as he searches the galaxy for her family. The animati on in this film is incredible. Seeing the galaxy for the first time left me speechless. The costumes are very realistic, which makes the characters look like they don’t belong in space. But, that is the beauty of this film, because we can see how opposites attract. My favorite part is when Rose, Fox and the Little Prince play a game called, “Red Light, Green Light.” Rose covers her eyes and Fox and the Little Prince can only move on green light. If they move on red light, Rose wins. It’s fascinating to see their friendship grow and it makes you want to join the game. The message of this film is to work as a team and to never give up. No matter what obstacle you encounter, there is always a way to combat it and push forward. I give this film 5 out of 5 stars for its nonstop action and unique plot. I have never been this intrigued by a film before. I recommend this to kids ages 6 to 12 and it is great to watch for parents as well. With such comedic jokes, relatable characters and a mysterious plot, there is something for everyone to enjoy. This film is available now on DVD. Check it out and find out if the Little Prince can find the Planet of the Roses. This animated series had me very delighted with all the life lessons that it teaches its young audience. I love that the Little Prince doesn’t just throw the life lessons in your face. It’s not obvious because, when you start watching it, it’s simply a casual storyline. But, if you pay close attention and analyze the characters and the events of the story, you start to notice all of the metaphors, figures of speech and symbols that hide real life lessons and sincere messages. audience. The Little Prince: The New Mission is about Snake telling the Rose that she her home planet and family are in danger. So, the Rose asks the Little Prince to go and find her planet fast. He promises her that he will go look for her planet. He asks Fox to keep an eye on Rose as he flies off on his plane promising he will return to trim the baobabs on B612, their planet. During his quest, he encounters four new characters: the hunter, the geographer, the king and the businessman. As he meets each one, they tell him that Rose’s planet is in another galaxy and offer to help him find it. Meanwhile back on B612, the baobabs continue to grow, Rose and Fox continue to argue and the Snake is freed from the sketchbook. When the Little Prince returns to his planet, he realizes he must set off on a new mission to fight his worse enemy and find the planet of the roses. My favorite scene is when the Little Prince meets the Hunter. When he lands on his planet, he learns that the Hunter has been on a mission to find this marvelous beast and, while he was on it, he harms all of the creatures living there. Wanting to protect the animals, the Little Prince asks the Hunter to draw the creature he is looking for. His description doesn’t match anything and the Little Prince realizes that the creature doesn’t exist. It’s inside Hunter’s head. The Little Prince and the animals create a plan to stop Hunter’s search. They are cleverly successful in their solution, but you’ll have to watch the film to find out what it is. One of the many life lessons that the Little Prince teaches, especially in these episodes, is that the baobabs need to be taken care of immediately. To explain, a baobab is a metaphor or a figure of speech for the problems we ignore and don’t pay attention to. Many of us ignore problems that are seemingly harmless at first, but later cause us regret when that tiny sprout of a setback transforms into a giant trouble. Baobabs start to grow small, but when they grow to be a huge tree, they are impossible to get rid of, similar to problems. 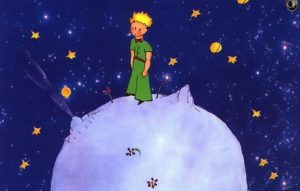 The Little Prince understands so he destroy any appearance of them on his planet so they don’t have the chance to dominate the planet. He would take care of the problem at the time. Not every Pegasus pony in Equestria is the same. Just ask Rainbow Dash and Fluttershy. 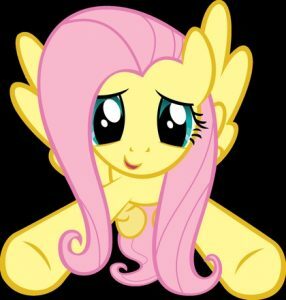 While Rainbow Dash is bold and daring, Fluttershy is quite reserved and caring. But that’s what makes Fluttershy such a wonderful friend to everyone around her, whether they’re her pony friends, like Twilight Sparkle, Rarity, Pinkie Pie, Applejack and, yes, even Rainbow Dash , or her non-equestrian friends, like Angel the bunny. Join in for five adventures that feature every pony’s lovably quiet Pegasus, Fluttershy. KIDS FIRST! Film Critic Sahiba K. comments, “My Little Pony: Friendship is Magic: Fluttershy… is lively and cheerful! The storylines are well thought out, with plots that relate to real life.” Samantha M. adds, “This delightful animated series brought me back to my childhood. With many comedic jokes, valuable life lessons and exciting adventures, there is something for everyone to enjoy.” See their full review below. My Little Pony: Friendship is Magic: Fluttershy, created by Lauren Faust is lively and cheerful! The storylines are well thought out, with plots that relate to real life. The variety of the personalities of each pony creates a realistic atmosphere where everyone is accepted. Each episode teaches how to deal with certain setbacks and different realistic situations through colorful and merry narratives. The story follows a pony named Fluttershy (Andrea Libman) who is timid and would do anything for friendships. She adventures through life with her fellow ponies including Rarity (Tabitha St. Germain) and Rainbow Dash (Ashleigh Ball), facing different challenges and never giving up. They maintain their friendships no matter what. Andrea Libman is the voice actor for Fluttershy and has a high pitch but soft-toned voice. This builds upon her personality as a shy, timid pony. When she lowers her voice to a light tone, one can tell she is feeling shy and when her voice rises, one can tell she is feeling more confident. Tabitha St. Germain voices Rarity who also has a high pitch voice. However, she uses more inflections in her voice to show how excited Rarity is. The animation and the sound effects are the highlights of this DVD. There are many different colors used throughout for the skin and hair of the ponies and for the scenic backgrounds. The variety of these colors is very visually appealing. 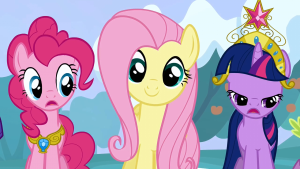 The animation of the ponies’ eyes convey a multitude of emotions. For example, when a pony is excited, its eyes widen. When they are scared, their pupils shrink. And when they are shy, their eyes look down. The sound effects add more emotion to the scenes. Different sound effects emerge as different words are emphasized. When Fluttershy is mad, loud and low sound effects further accentuate these emotions. My favorite part was seeing how all the ponies in different colors, shapes and sizes. Everyone gets along and nobody cares how their friends or fellow ponies look. It is an analogy for real life. The messages are about the importance of friendship and about never giving up despite the circumstances. I give this DVD 4 out of 5 stars and recommend it for ages 5 to 10. Check out My Little Pony: Friendship is Magic: Fluttershy when it’s released nationwide on DVD September 12, 2017. This delightful animated series brought me back to my childhood. With many comedic jokes, valuable life lessons and exciting adventures, there is something for everyone to enjoy. There are six Pegasus ponies who are unique in every way. You are certainly able to relate to at least one of them. Join Fluttershy and her friends in five enticing adventures to find out which pony you truly are. 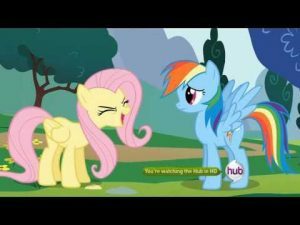 Elaborating upon the importance of friendship and self confidence, this series documents Fluttershy’s journey through life. 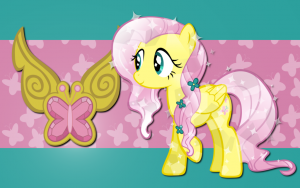 Fluttershy is a timid pony, but she will do anything to stick up for her friends. Watch how Fluttershy discovers who she really is with the help of her friends Twilight Sparkle, Pinkie Pie, Applejack, Rainbow Dash and Rarity. Tabitha St. Germain, who plays Rarity, successfully portrays a teenage girl through Rarity’s desire to shine bright in the fashion world. 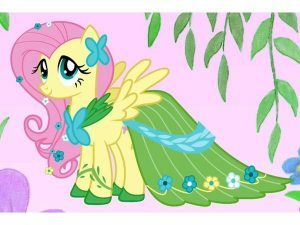 In the episode, “Green Isn’t Your Color,” Rarity urges Fluttershy (Andrea Libman) to model for Photo Finish, a famous fashion designer. 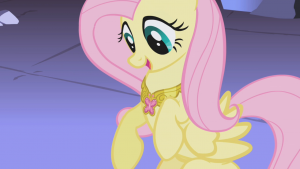 Libman’s sweet voice acting characterizes Fluttershy as a shy pony with a beautiful heart. You can hear the confidence build up in her voice with every new adventure she experiences. The animation in this series is incredible. Compared to the My Little Pony that I watched as a kid, these Pegasus ponies are depicted as teenagers instead of children. The ponies are older, bigger and more knowledgeable, which makes them very relatable. Even though the ponies are older, their charm and kind hearts continue to grow, yet they still manage to enjoy life just like little kids, with no worries in the world. My favorite part is when Spike tells Twilight Sparkle and Pinkie Pie that he has a crush on Rarity. I love how Spike completely trusts Rarity’s friends to keep a secret. Friendship is extremely important and Spike is very lucky to have such caring friends. The message of the series is to value friendships that you make with others. Friends help you become a better person and they always have your back. No matter what happens in your life, as long as you have a good friend when the world seems to turn on you, you’ll be fine. I give this DVD 5 out of 5 stars and recommend it to ages 6 to 12. Teenagers and adults will love it too, since friendship is applicable to everyone. This DVD is available now, so check it out. It is sure to warm your heart. You are currently browsing the KIDS FIRST! News weblog archives for September, 2017.